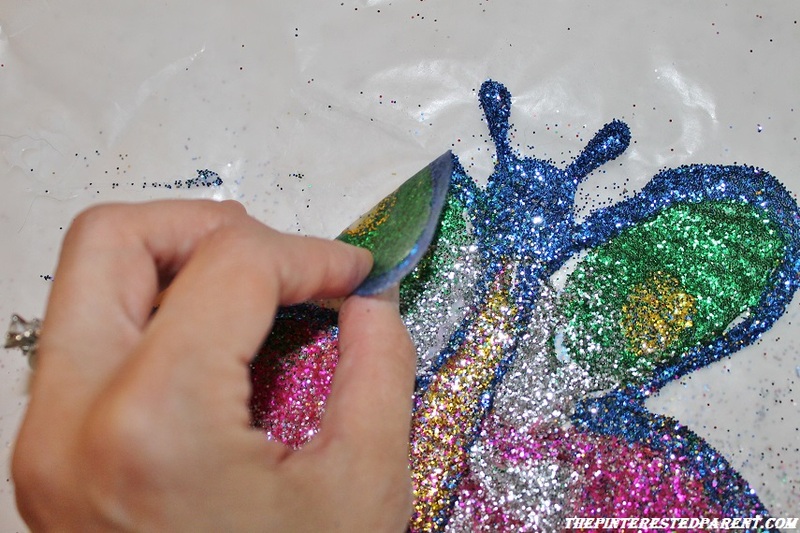 My daughter loves arts & crafts, the messier the better, so when I found this craft in one of our library books that combined glue & glitter, I knew that she would have a field day with it. 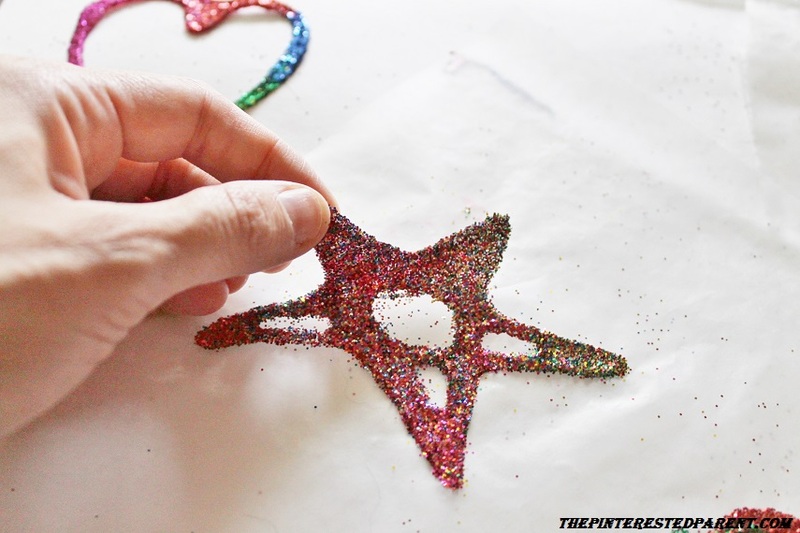 Lay down some newspaper or a something to catch any stray glue or glitter. 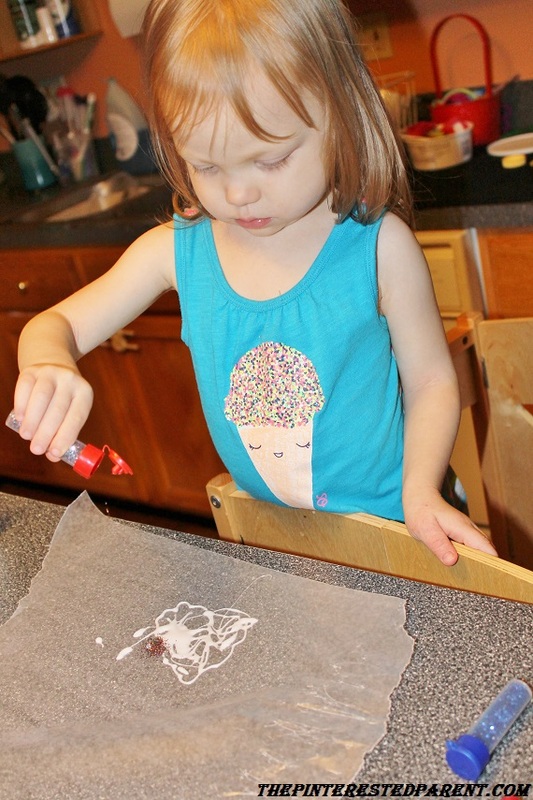 On a piece of wax paper draw pictures, shapes or designs. Show your child & allow them to do the same. 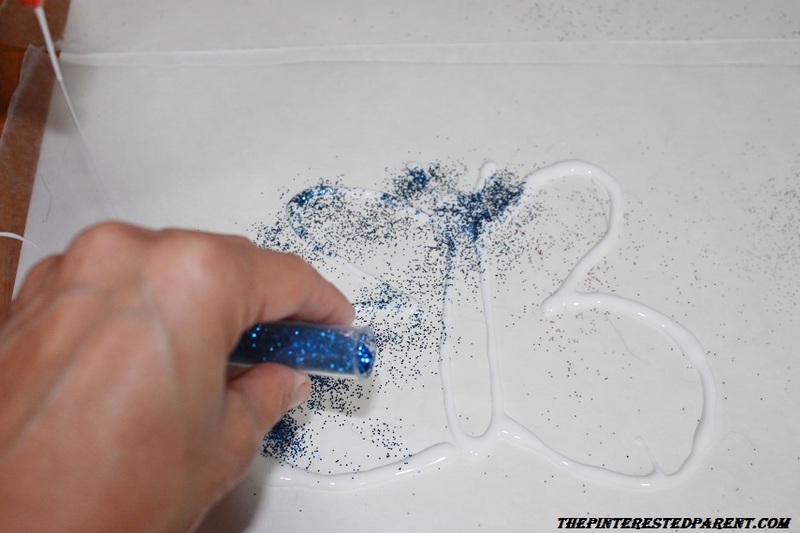 Shake glitter over the glue & move around the wax paper until all the glue is covered & then shake off the excess glitter. Let dry. 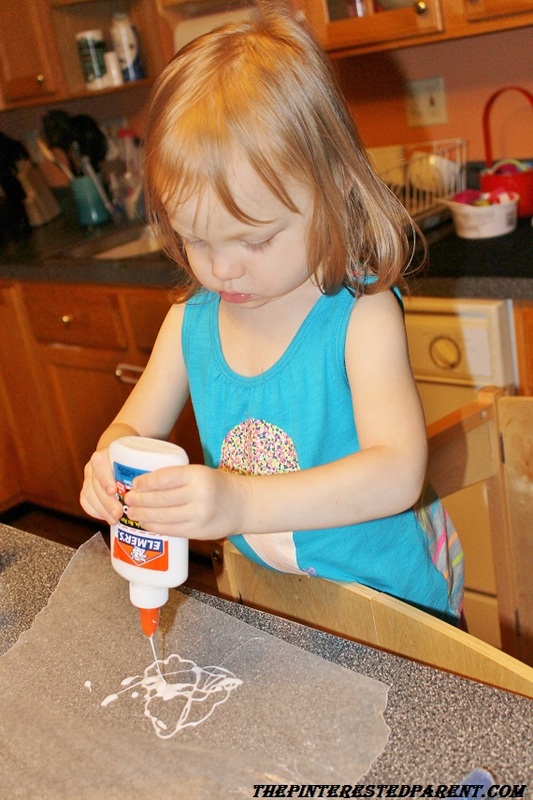 (Depending on the amount of glue that needs drying this may take a full day. You may also use a blow dryer on a slow setting to help speed up the drying.) Peel of from the wax paper. I will be honest with you, I did not believe this would work, but I was wrong. The shapes & designs peel off nicely & easily. Mama goes first to show Mai what to do. 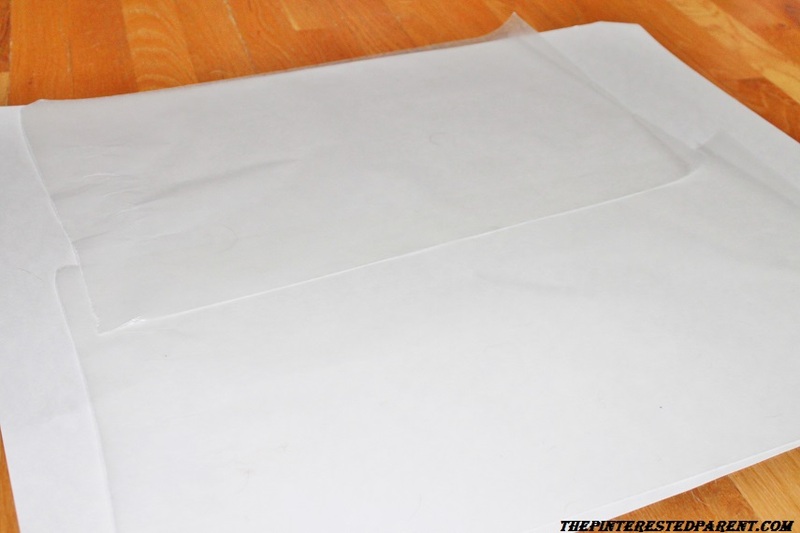 Lay down your drop cloth or newspaper & place wax paper on top of it. 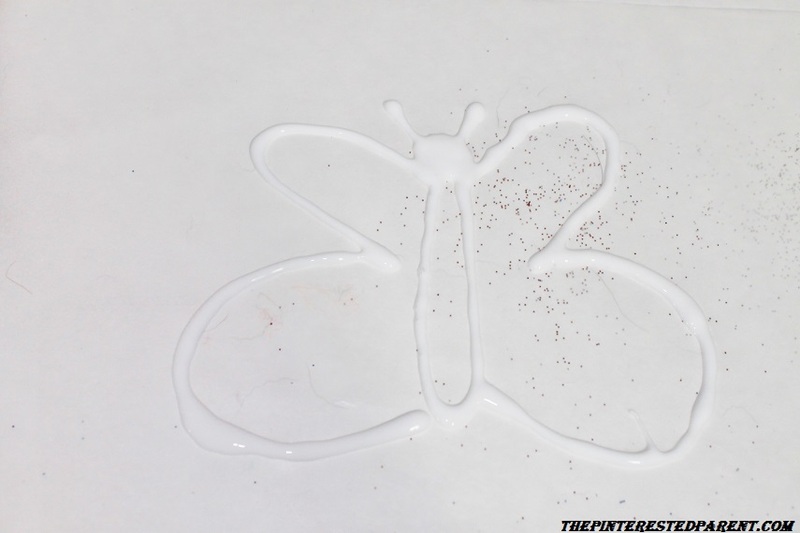 Draw your picture out with glue. 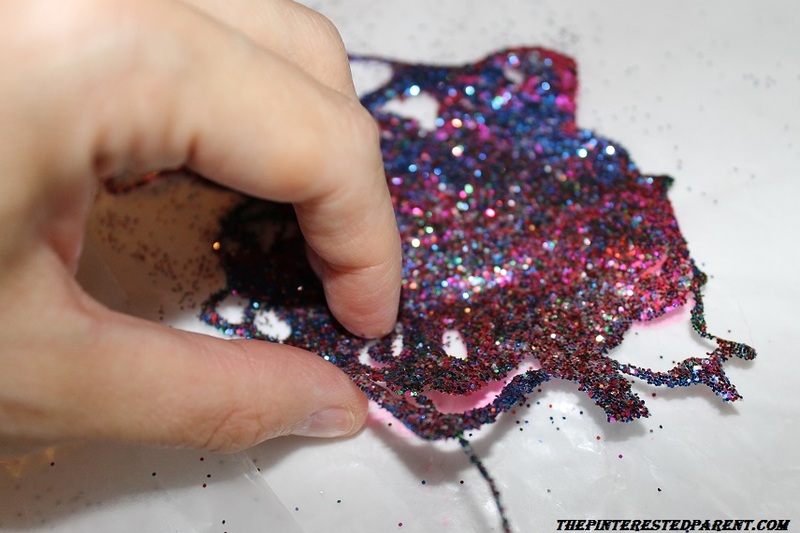 Shake out the glitter onto the glue. Move the glitter around until there is no glue showing. Have your toddler do it next. My daughter is only 2, so her drawing are a little more abstract, but she is fine with that. 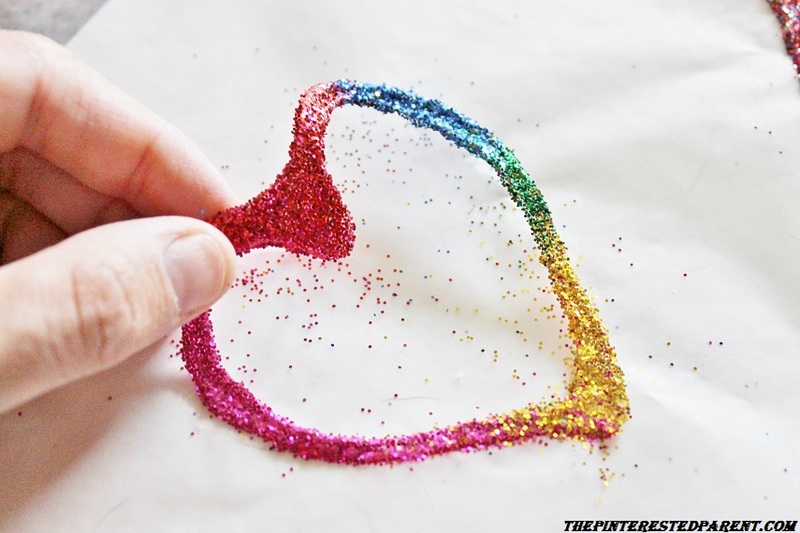 Let the glitter fly. 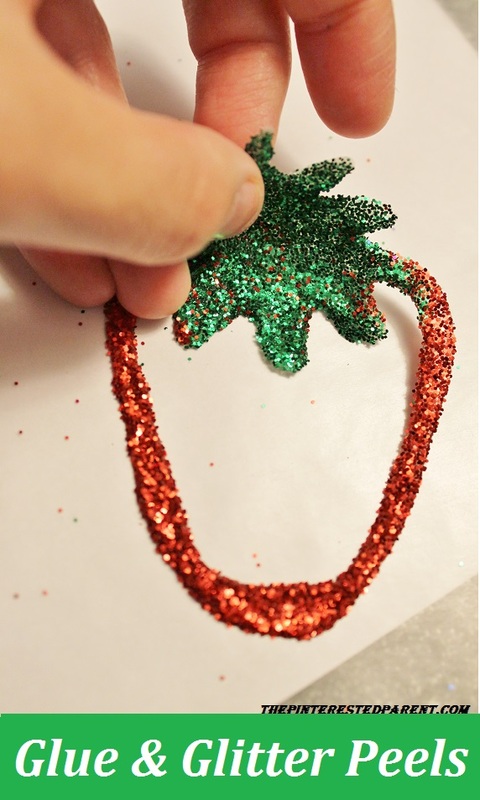 Don’t be surprised if they get a little zealous with the glitter. 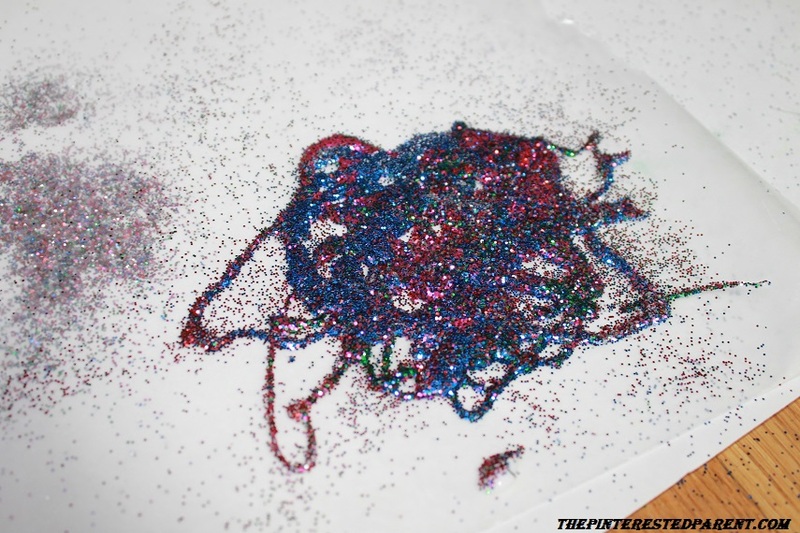 Mai could not get enough of the glitter. 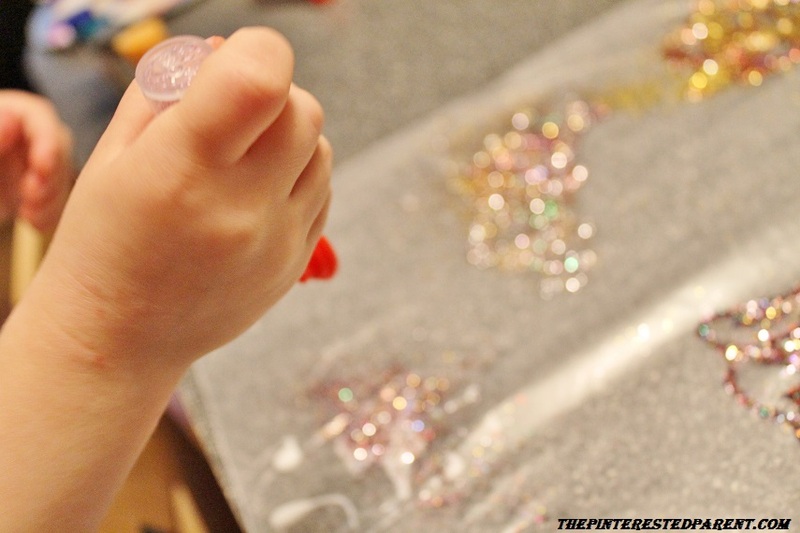 I kept reminding her to make a new glue picture in between her glitter frenzies. 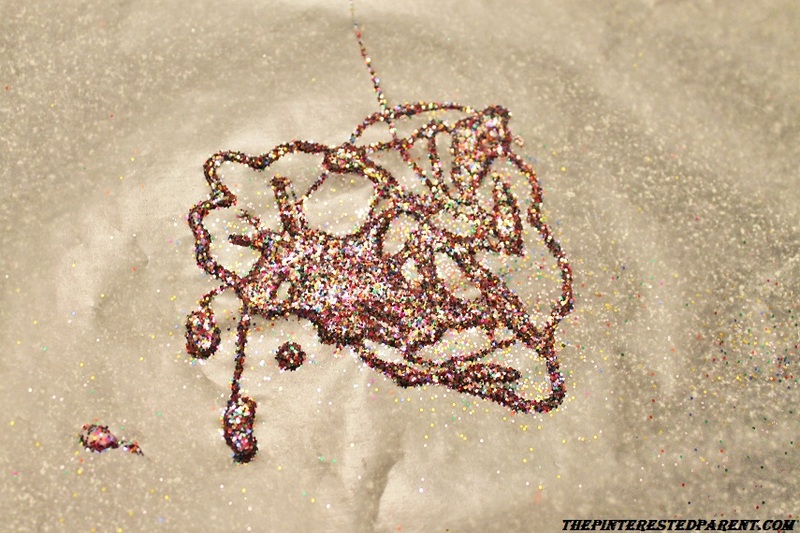 Here is one of many of Mai’s pretty sparkly designs. Let all of your designs dry & then peel. 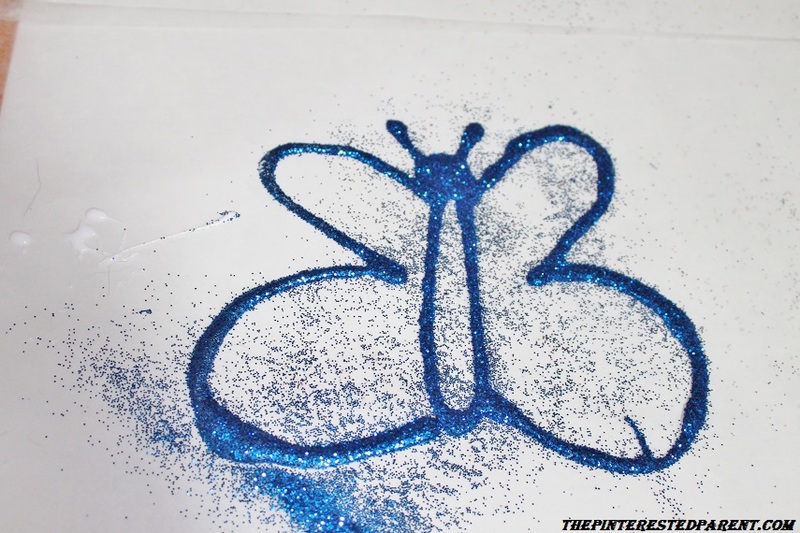 This was a cute & fun craft. Mai liked it so much, we did it two night in a row. What a crafting son you have. I love it! They were fun. I love peeling glue. Necklaces would be cute. Thanks for the suggestion. Yeah, I gave up dreams of having a clean house. I definitely hear you on the having no energy part. I am right there with you. Wow this is such a great idea! Thank you. My toddler will love this :). Thank you. These were fun & came out cute. 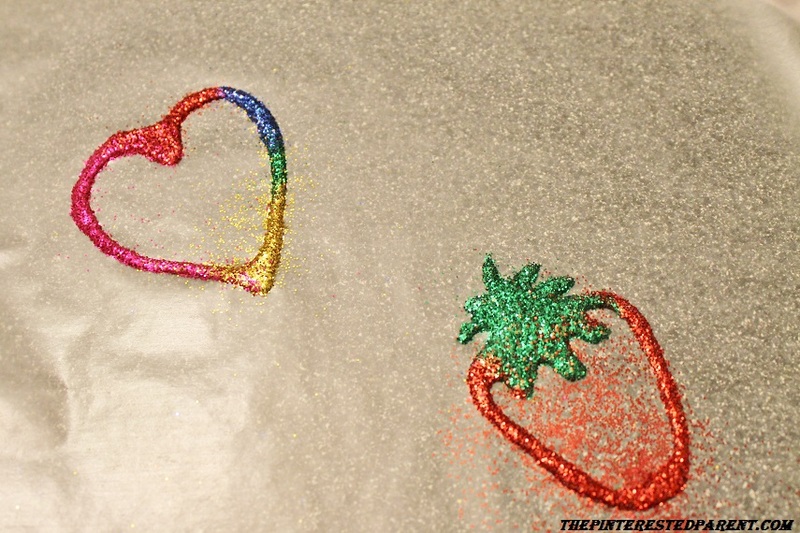 My daughter loved the glitter. I’ll definitely try it & post it so you can see :). Thank you. It was a cool project. Easy and cute.